Eliminates transmission noise and vibration, conditions transmission seals, breaks down sludge, gum and varnish and helps fight rust and oxidation. Atomium AGSB 80 is a transmission conditioner for the treatment of automatic transmission or gear boxes of any car that uses transmission oil Dexron ATF (red oil). The treatment is completed in one stage. 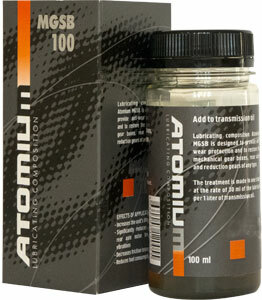 Add one bottle of Atomium AGSB 80 at fluid change or simply add to existing fluid. 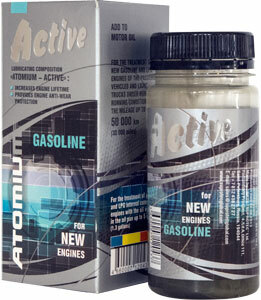 Add two bottles of Atomium AGSB 80 if the total transmission fluid capacity is more than 12 liters or 12.5 quarts . After applying Atomium AGSB 80 drive the car for at least 20 minutes. Operate the car normally until the next regular transmission fluid change. Before applying Atomium AGSB 80 shake the can thoroughly until natural sediments (active components) are totally dissolved. Apply Atomium AGSB 80 through the regular dipstick hole of the warmed-up transmission. 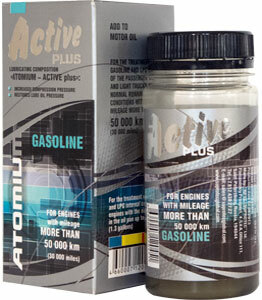 Drive the vehicle for at least 20 minutes in any mode (regular operation) after applying Atomium AGSB 80. It is not recommended to apply the lubricant if you know of any mechanical issues with the parts and assemblies of your transmission. 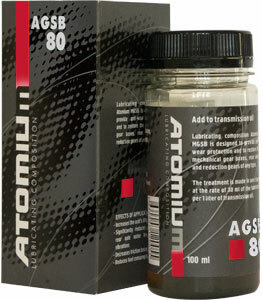 Atomium AGSB 80 is compatible with any type of transmission oils ATF – Synthetic Automatic Transmission Fluid (the red oil) and doesn’t change their properties. To maximize protection of the unit it is recommended to apply further after each oil change in transmission (every 90,000 – 125,000 ml).